Are you of the generation who came of age cruising the streets of Metro Detroit during 50’s, 60’s & 70’s? Are you ready to relive your past once again? Are you a car buff looking for your ultimate ride, or just a picture of your dream vehicle? Maybe you’re just a music fan who loves the music of Elvis, The Beach Boys, The Ronettes and The Four Seasons. Or perhaps you are just looking to enjoy one of the premier family friendly, quality of life events in Oakland County. Well, put on your sailin’ shoes! All those things and more will be there for you at this year’s 21st Annual Woodward Dream Cruise. The fun begins on Saturday, August 15 and goes from 9 a.m. to 9 p.m. The Woodward Dream Cruise is the world’s largest one-day automotive event, drawing about a million car lovers from around the globe to participate in what has become over the last 20 years, the annual rite of summer. The coolest of cool will be cruising along a stretch of Woodward Avenue in Oakland County, through the communities of Berkley, Birmingham, Bloomfield Hills, Bloomfield Township, Ferndale, Huntington Woods, Pleasant Ridge, Pontiac and Royal Oak. Many of these communities will have unique events leading up to and during the Dream Cruise on August 15th. Click here for a full listing of events and for more information. On Friday afternoon, August 14th, the City of Ferndale will host its 15th Annual Emergency Vehicle Show. Over one-hundred emergency vehicles, including vintage & custom police cars, ambulances and fire trucks will be in the show, with many being brought in by private owners who are traveling many miles to participate. Their Lights & Sirens Cruise down Woodward will take place at 5:30 after the official Dream Cruise ribbon cutting. Along with the Emergency Vehicles, 9 Mile Road on both sides of Woodward will have live entertainment, food vendors, and a Kids Play Zone. Ferndale is also the host to the 17th Annual Mustang Alley Show on the 15th, which goes on at the same time as the Dream Cruise. At last count over 400 Mustangs have registered to be there. This year’s event will mark the 51st Anniversary of the original Ford pony car, the Mustang. 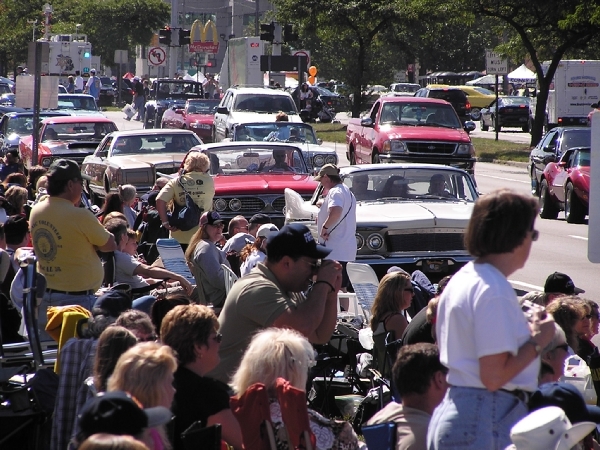 The crowd watching the cars on Woodward during a recent Dream Cruise. Return to the world of jellyrolls, hula hoops, coonskin caps, bouffants, slinkys and bell bottoms, if only for a day, at the Woodward Dream Cruise. For more information on the Woodward Dream Cruise, visit their website and follow along on Facebook and Twitter for news as it happens.